A man who wed a woman while already married has been cleared of bigamy after a judge accepted his first wedding may not have been legal. Iain Theyers, 45, of Inverness, re-married in 2011 while apparently wedded to Marian Belahonia, 38, of Peru. Ms Belahonia, who wanted to file for divorce, discovered through Facebook he had re-married, Hull Crown Court heard. 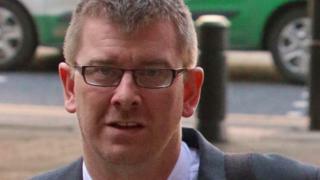 While ex-Robin Hood Airport manager Mr Theyers' conduct was "reprehensible" he had no case to answer, the judge said. The couple met when Ms Belahonia moved to Nottingham while Mr Theyers was working at the airport, and married in 2006 at her parent's home in Peru, while pregnant with his child. Ms Belahonia returned to Britain and was later granted full UK citizenship in 2013. After their marriage deteriorated in 2010, she tracked him down on Facebook in an effort to file for a divorce, but then discovered he had married Louise Martin in 2011 at Bridlington Town Hall. Mr Theyers claimed his marriage to Ms Belahonia in Peru was a sham to enable her to get a UK visa. During a three-day trial Judge Jeremy Richardson QC, heard she paid $50 to "a man in the street with a brown envelope" to obtain a marriage certificate. "I have no doubt the defendant has behaved in a reprehensible fashion," he said. "He is not charged with immigration evasion. "Although he does not come out of this well, I have misgivings about the validity of the marriage among the experts and that is not proper to leave to a jury." Giving his ruling, Judge Richardson said: "The Crown expert appeared astounded the Peruvian authorities allowed the marriage to go ahead... and ruled the marriage was voidable." However, he stressed he was not ruling on whether the marriage was a sham or not - as that should be an issue dealt with by a family court.